Is This The Most Summer-y Salad Ever? The hardest thing about living in a four-season locale is that wanting to eat salad can be influenced entirely by the temperature outside. But when summer finally rolls around and vegetables start tasting like actual vegetables, we can’t think of anything more refreshing than a salad. Throw in some avocado (because, obviously), corn and fresh cherry tomatoes and we could eat it every day. 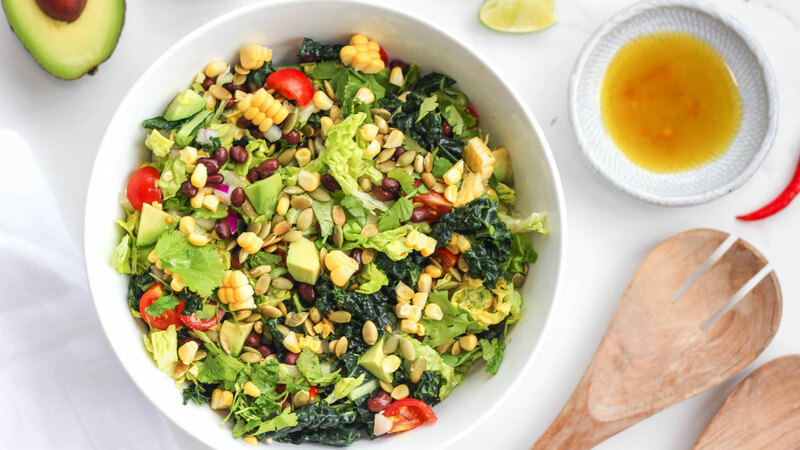 Good thing, Mia Rigden creator of healthy-eating site RASA, put together an entire book chock full of superfood-dense and delicious summer salads. Below is one she dubs the “Fiesta”. This salad boasts over ten different types of plants. A nutrient powerhouse full of flavor and healthy fats. 1. Chop kale and little gem lettuce and add to a large salad bowl. 2. Use a knife to cut kernels from ear of corn. Chop tomatoes, herbs and avocado, and set aside. 3. Heat pumpkin seeds in a small sauté pan over a medium heat until they start to brown and are fragrant. Take off heat to cool. 4. Add all salad ingredients to a bowl and mix together, reserving pumpkin seeds for garnish. 5. Add all dressing ingredients into a jar and shake vigorously until combined. Use a fork to whisk the honey, if using. 6. Top salad with dressing and pumpkin seeds and serve.